Chinese used to stick spring couplets on doors during Chinese New Year in the old times. It turned out that Korean also liked to do so. These two photos were taken in Seoul Namsangol Hanok village. 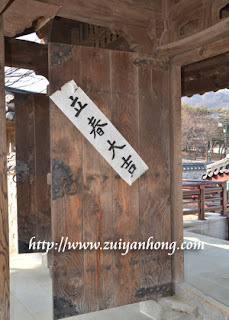 The doors of the traditional house were pasted with couplets. The first couplet means auspicious New Year and the second couplet is continuous joyous. Chinese couplet is written with black ink on red paper. 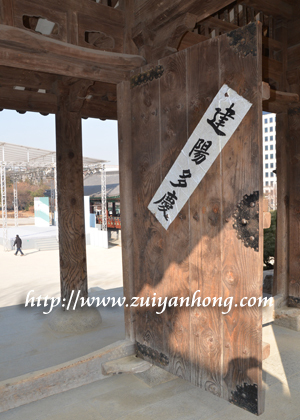 On the other hand Korean couplet is written with black ink on white paper. The reason is Chinese believe that red is propitious yet Koreans consider red is dangerous. No wonder I had never seen any Korean automobile red in color. However, the yin yang of South Korea flag is a combination of red and blue.